Store your wine bottles in style with this handsome rack that keeps bottles up and labels readable. Judge a wine by its label? Whether it's the lovely artwork or a prime vintage you want to show off, this clever rack lets you put your vino on display. Designed to keep standard 750 ml bottles slightly elevated (and labels readable), the steel rack positions your wine at an angle that ensures that the liquid stays in contact with the cork. A moist cork means no shriveling or shrinking, so air can’t get in and ruin the fun with premature oxidation. 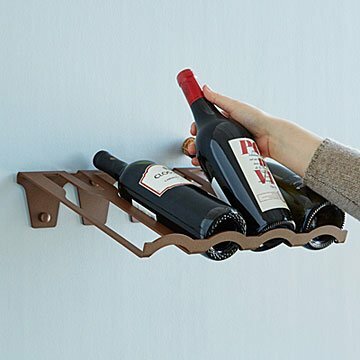 Install the rack on your wall with the included hardware, and it'll hold up to four of your favorites, keeping your bottles up until it's time for bottoms up. Made in Italy. Use two or more people to move, assemble and/or install rack to avoid injury. Do not Leave children unattended near rack. Install the rack on a sturdy surface with appropriate fasteners. If the rack is loose do not place bottles on rack until rack is securely fastened to wall. High risk of tipping or falling exists if the rack is not installed correctly. Use the rack for its intended purpose only, the storage of bottled beverages. Never Allow anyone, including children, to sit, stand or climb on the rack. Doing so may cause damage, serious injury or death. Di Prima USA, LLC is not responsible for damage, injury or death caused by improper installation or improper use of the rack. TO THE EXTENT LEGALLY PERMISSIBLE, DI PRIMA USA, LLC DISCLAIMS ALL EXPRESS OR IMPLIED WARRANTIES INCLUDING WARRANTIES OR MERCHANTABILITY AND FITNESS FOR A PARTICULAR PURPOSE. I have finally found the perfect wine rack. Easy to assemble and it looks good! Perfect Solution to my fine Italian wines. Perfect, practical and stylish solution to my home. Absolutely beautiful! Will definitely buy again. I have been searching for a wine storage solution that was elegant enough for my home and would work in a limited space - this wine rack exceeded my expectations. It's beautiful design and quality are superior to anything else I have found. I love how easy it was to install. I am purchasing more to add on to this one. Incredibile quality and amazing Italian Design! It's been a while since i'm looking for a solid and resistance wine racks, not only for my expensive wine collections but also for my daily wines.